I have written before that I like celery root very much and that this specific recipe for puree was in my mind for a long time now. 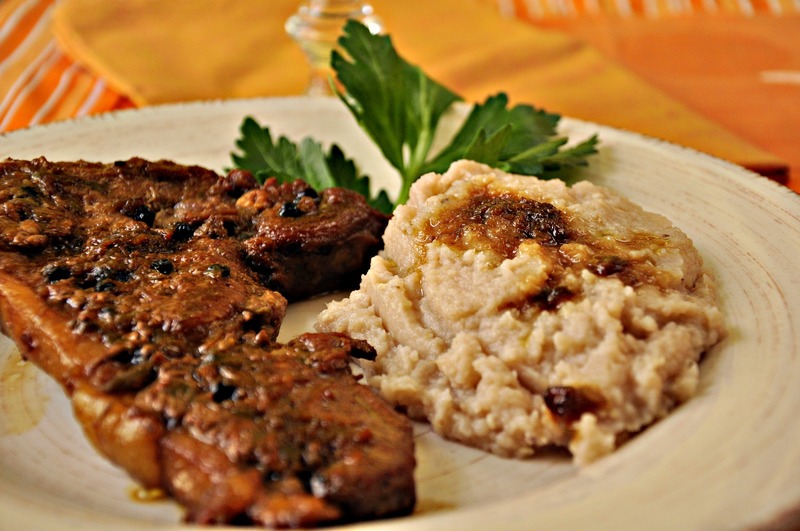 Well, it turned out to be a delicious and sweet puree, eaten hot and matching very well with these slightly adapted pork steaks, inspired by Vaggelis Driskas’ recipe –but I followed the exact instructions for the puree because I didn’t know what the result will be and I was successful! Try it and you will not miss! 1. Prepare puree: Put a pot to boil with lots of water and salt. Peel celery root just like you will with the potatoes by removing all the hard shell and cut it smaller pieces. Do the same with the potatoes and put them in the boiling water. Let them boil until they are soft. 2. In the meanwhile, take a big pan, add some olive oil and put the onion and garlic to brown. 3. Add the steaks and let them saute both sides. Pour the wine and after 1’, add peppercorns, salt and 1 cup of water. Put the lid on and let it cook in medium heat for about 45’-1 hour. 4. While they are cooked, check if any water is needed to add. When they are ready, pour the molasses and let it 5’ more to caramelize and heat off the fire. 5. Go back to the puree: smash the boiled vegetables and add parmesan, walnuts and olive oil. Stir well, taste and add some salt –if needed! 6. 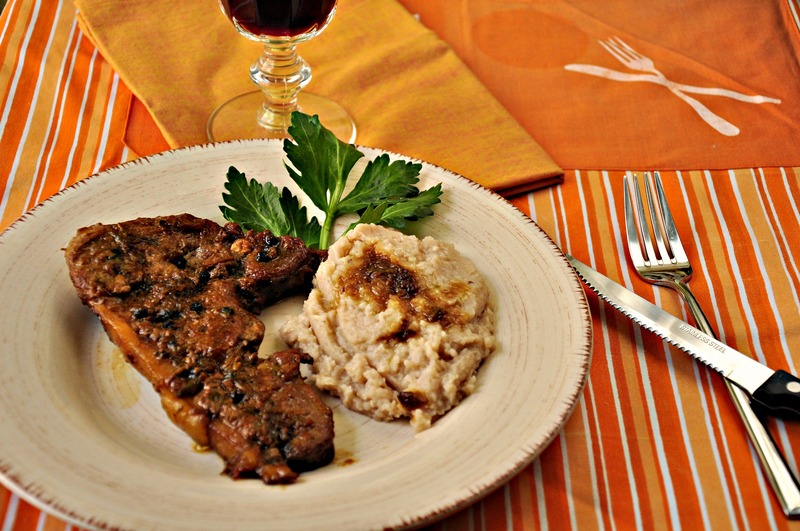 Serve warm pork sweet steaks with the puree and drink the rest of the wine left from your cooking! 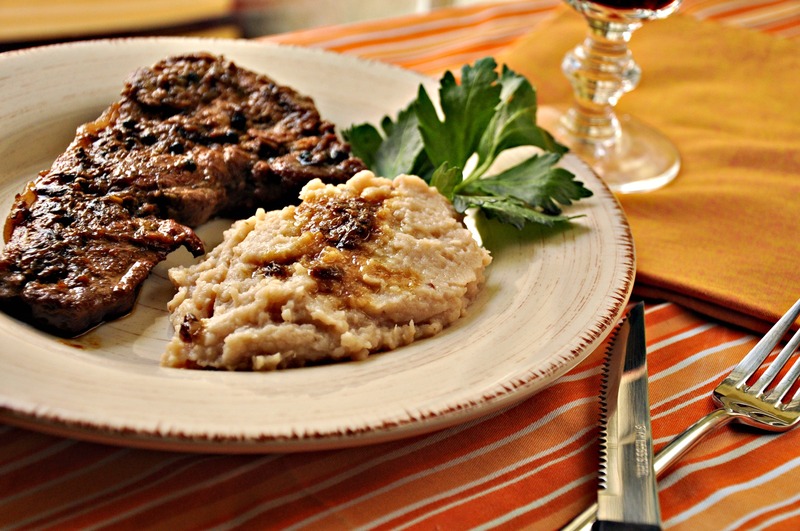 Pork steaks "a la hasapa" (butcher's) and baked potatoes "a la fried"!